This is the size small adult shirt. I have made actually two of these, one for me and one for the store. 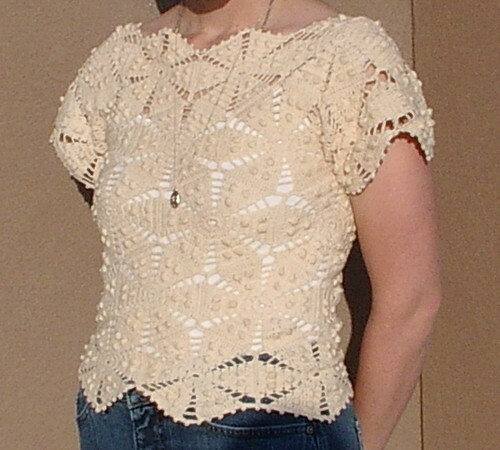 This is a pull-over top. This shirt is the same as the skirt in that it is not lined to give you ease in matching your clothes for the day; just wear a camisole or tank top of your choice in color. I think it has a soft feminine touch with jeans or a skirt. 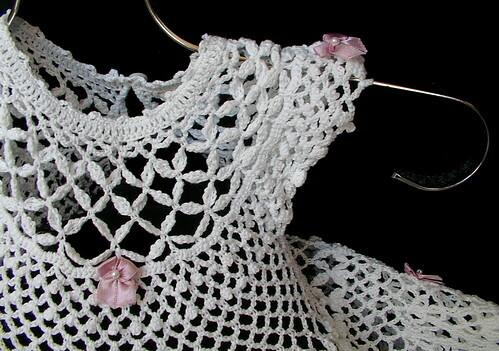 When paired with the matching crocheted skirt, it has a real nice 1950's starlet look. 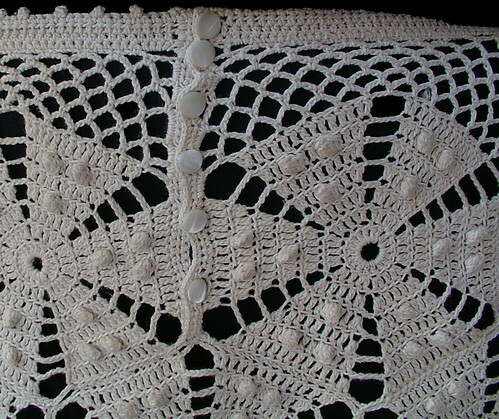 This is one of the items I made from those found hexes. I really like this skirt. 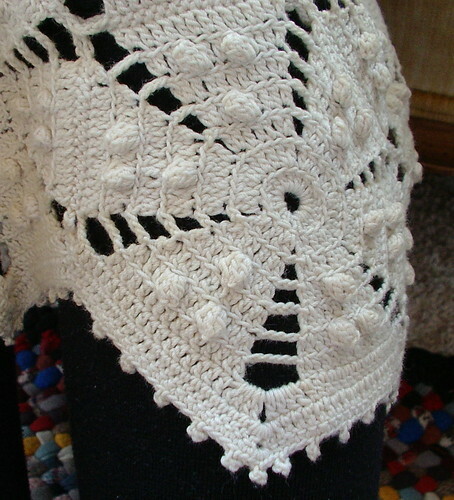 I used antique buttons on the back of the skirt as the closure. On my other forums I have had a lot of comments on the lining of this skirt it actually isn't a lining. There is no lining on the skirt that is just the slip I picked for the day. I don't like to line skirts that way I have the option of color change. I wanted graphic patterns that day. If I want just soft color I would have picked a pale pink, white, or ecru slip. I also made a shirt, and I have just enough hexes to make another shirt and skirt for the store. The second set is only half made at the moment. I wore this today while job hunting. I think more people where interested in the skirt. It was funny how many people asked if I had made it, the fact that I made the skirt seemed to surprise most people. Then they asked for the whole story and got even more surprised. Sometimes I feel like a dying breed of a person. But in the same breath I wouldn't have it any other way. I love making things; it is who I am, just too bad I haven't been able to figure out a way to make a good living at it so I can stay at home with my kids and still craft and make money to help out my family. 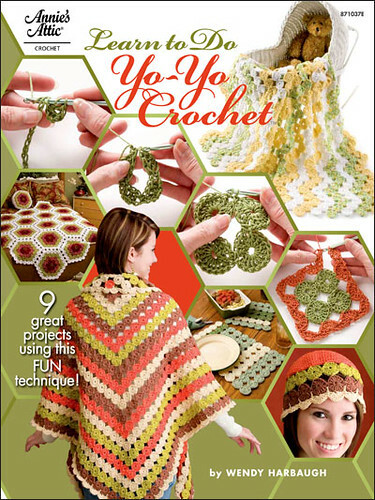 On a side note for those who are on Ravelry, you can find me here. 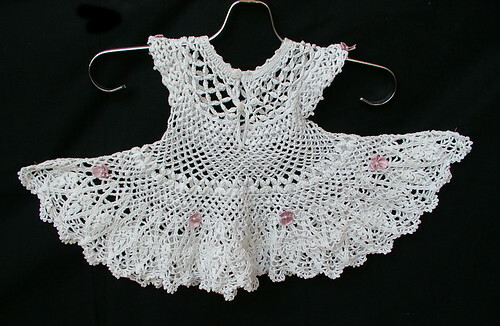 Dress for the store, size 0 to 3 months. 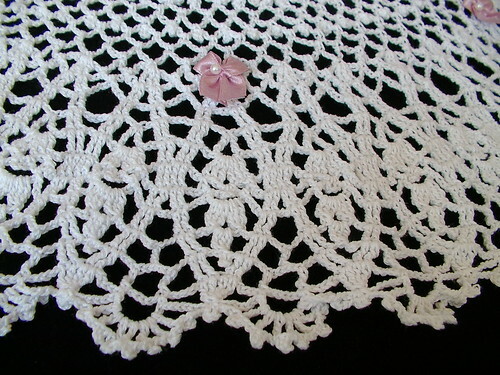 White thread; not sure if it is vintage, antique or new. I found it, the thread that is, without a label, while thrifting. I do know it is a 100% cotton. This has been an on- and off-again project for about two months, and now it is available for you. This dress took my trip with me, to entertain me while traveling on the planes on my way to the Caribbean, so it is made with love and found memories. Just playing around with maps. I wish the country map was more detailed because you can't see some of the places I clicked on very well. My camera keeps acting up lately. Some days it works fine; others, not at all; and sometimes it converts the pictures I take into unreadable files. This is one of three pictures I took while trying to see if my camera would let me take photos today. This is the only one that came out. Not half bad; I just wish it worked more regularly because I may end up with a cute picture of my kids that isn't really there. 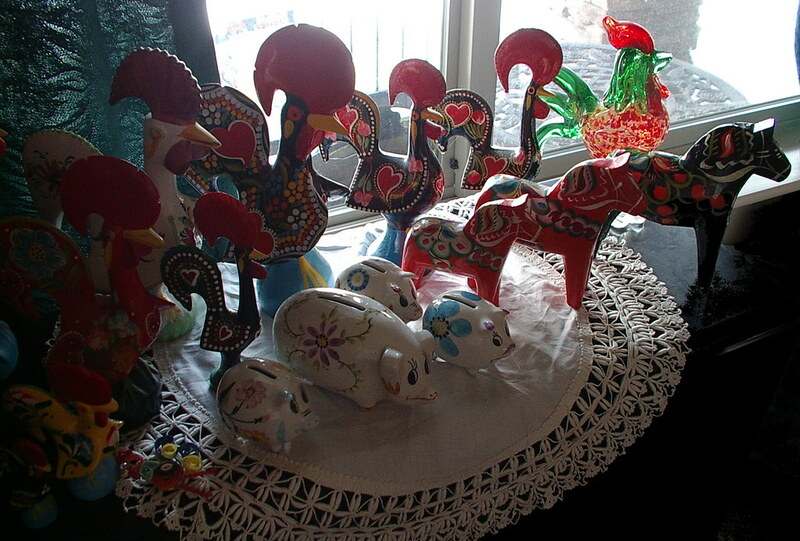 In case you are wondering, I collect Portuguese roosters and Swedish Dala horses. The little pigs are a gift from my older sister; three little pigs to represent my children, and one mae pig to represent me. These, too, are from Portugal. 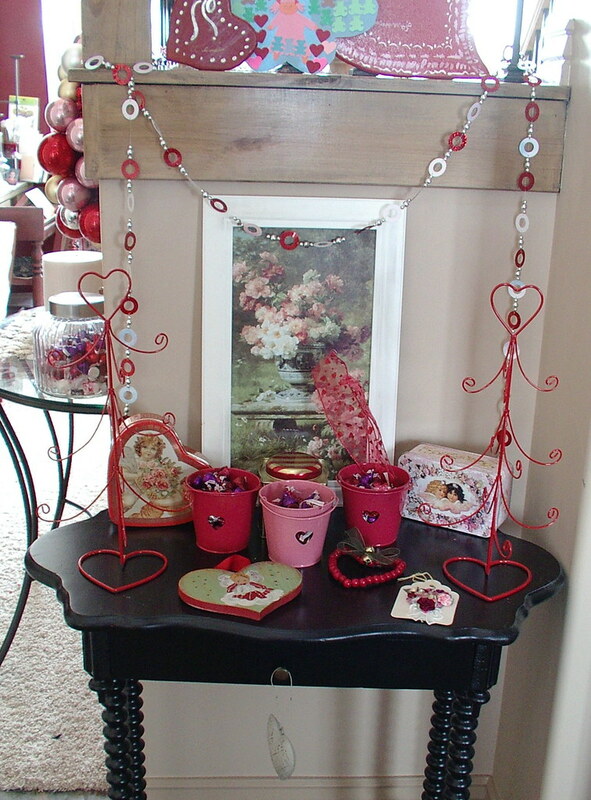 We just put Christmas away yesterday, but my children still wanted to put Valentine's Day up, even though it had passed. 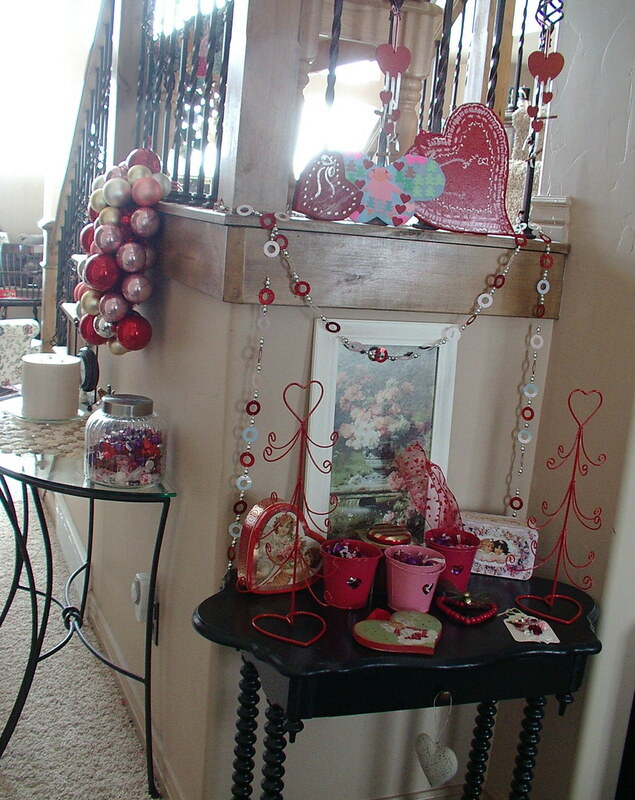 So even though this is after Valentine's, here are a few decorations the kids had me put up. I know it isn't much, but after the Christmas staying up a few months longer than expected due to me being so busy with their schools and all, I was worried if I put up much more it would never come down. If anyone remembers, my kids entered a tree decorating contest at Christmas time. Well, they did not win first prise, but they are fine with that. They did win one of the other prises, and they think it is better than first prise. They get to have their tree in a magazine next year at Christmas time. How's that for ages 6, 8, and 10. They got in a magazine 20 some-odd years before their mother did, age-wise that is. Because of this, yes Christmas is still up at our house because I haven't had a chance to take good photos, yet; at least not ones I want to have the world see. They also got this prize in the mail as a thank you for entering. 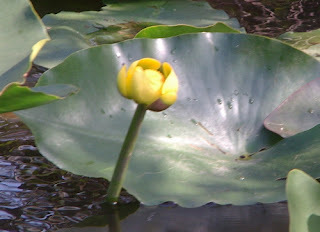 This is not my photo; someone at Mary Jane's Farm took the photo, that is who hosted the contest. We wanted to do something special for Sunshine's little farmerettes that won an honorable mention in the Christmas Tree Contest. Their tree was so beautiful and all handmade by the three girls.Thanks for sharing your beautiful tree with us and watch the mail for a package! homemade icecream, originally uploaded by sunshine's creations. 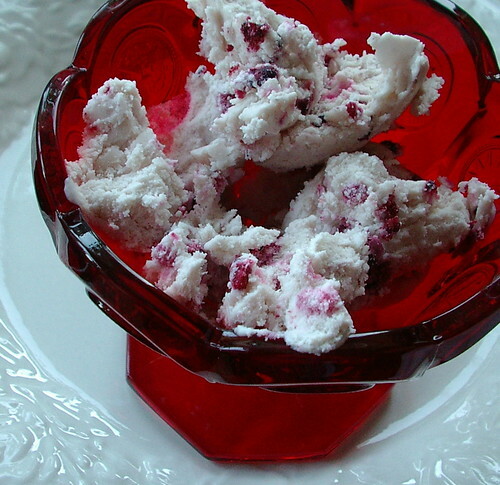 Blackberries and raspberries, whipping cream, condensed milk make for a nice bowl of homemade, hand cranked, ice-cream. 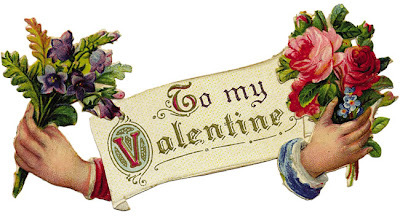 Hope you have a lovely day. a cup to a few cups frozen berries cut in tiny pieces; no exact measurements here, we just did what looked good. You can also substitute other things here, cut up candy bars, cookie dough and so on. This is my husband's recipe. My commute from piano practice is usually about 30 minutes at 4:30. I left a few minutes ;) early tonight about 4:20, but I didn't get home till almost 7 pm. I have never been in a blizzard like that one, nor do I want to be again. It was white-out for more than an hour. My children slept in the back seat for most of it as I watched big rigs sliding and almost hitting us. I watched police officers who where directing traffic in the middle of the white-out in the middle of a 4-lane highway almost get hit by the big rigs and a Mustang. I was white-knuckled most of the way home! I called a few family members to let them know where I was and that I was still OK, but boy, I was really worried for awhile that I might spend half the night trying to keep my car from icing over. I felt great relief in that I had filled my gas tank first thing in the morning and had placed new windshield wipers on my car just a few weeks ago. But, that said, I didn't feel safe; I didn't have our chains in the car, don't ask why. But God was watching over me. I saw car after car after car slide off the road or just stranded with wheels spinning in the middle of the highway in over 8 inches of snow that looked to have landed in the 1 hour of white-out. For some reason, my car never got stuck in that way or slide. I am glad to be home and that my three children are safe. Good night, all; I am tired. The whole story here. This happened several times while I was on vacation. If I missed your tagging me, sorry I lost track of a few of them. 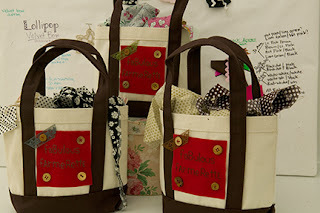 First tag was from http://ruby--slippers.blogspot.com/ then http://nostalgichomemaking.blogspot.com/. If more of you tagged me, sorry I don't remember where the comment was from. Link to the person that tagged you. Which I did. Post the rules on your blog. Share 7 random and/or weird facts about yourself on your blog. Tag 7 random people at the end of your post and include links to their blogs. Let each person know that they have been tagged by leaving a comment on their blog. Didn't know I was afraid of swimming in the ocean till my last trip. I had been to the beach many times and swam in the ocean. But never to the point where the water was deeper than twice what I was tall (this was 5 times deeper or more) and never to the point where I couldn't reach the shore with a few stokes in swimming. Well, I went snorkeling in Christmas Cove in St Thomas; that was an eye opener. I realized I was scared which started an asthma attack. So I was ferried to the beach where I built up my courage and started to swim on my own back out to the snorkeling area in little steps; not totally on my own -- my husband was a dear and went with me to help build my courage. Gotta love that. By the time we had finished I wasn't scared anymore and had tons of fun. So found fear and concurred it. Pat myself on the back; I swam all the way back to the boat that was anchored in the outer part of the cove. Doesn't sound like much, but I was ready to just sit on the boat at the time. I would have missed all the cool fish and swimming with four sting rays, which I will always remember. In high school I used to own a vinyl mini skirt and vest that I found junking. I loved it; my friends thought it weird. So, sadly, I gave it up; at times I wish I still had that and the chain mail mini skirt I made my 10th grade year that was cool. I wonder who owns them now since they went to a local thrift store in California. I am one of three children, plus I have two half siblings, and I have one step brother. Try to explain that genealogy to a six year old. Gets a little confusing for them, not me. 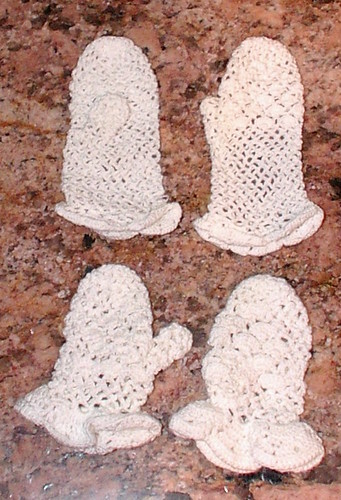 First thing I made in crochet was a pair of lace gloves for my oldest daughter's blessing/ christening. I made these without a pattern. The first set used size 10 thread with size 10 hook; next set used size 30 crochet thread on a 13 hook. OK, I said this was my first project. 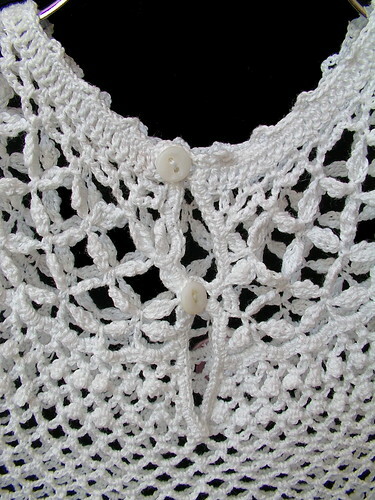 I had crocheted as a child -- just chains and slip stitch cord. At the age of 24 I picked up a hook for the first time in 18 years and bought a book with basic stitches and started to make the gloves without trying anything else first. I actually made two pairs by the special day; a cream set for every-day use and a white set to wear on that special day. On my third date with what is now my husband, I ended up in the hospital with stitches in my right elbow from having gone single track mountain biking with him, when I hadn't ridden a bike in about ten years. Not wise, I know, but it was fun and now we have a silly story to tell. From the event just above, my husband learned that when I am real nervous (ie stitches) I start to laugh uncontrollably, a reflex I know, but it is weird to me, but that is how I am. I used to love making friendship bracelets; even got to the point where I could put words in them. I think every sk8boarder in the town I grew up in had at least five of them during the years I was in high school. You could always see me making them whenever I had a stray moment. The reason I bring this up is, Sunday I saw a girl doing just the same thing I did as a teenager; safety pin attached to skirt and knotting away. When church was over I explained to her I used to make those and explained how to make words in the knots. She was excited to go home and try. So I got this sort of nostalgic feeling that all her friends would be like mine, with tons of bracelets made with love and a few words. Since I am doing this all at once, consider the 10 people below tagged and awarded. By accepting this award I must now share with you 10 blogs that I also deem 'excellent'. If you are one of my 10 you then choose 10 blogs that you feel have an excellent quality about them. You can give it to as many people as you want-even those that have received it already, but please award at least 10 people. manda at tree fall Because of her beautiful skills in making things and her determination. She may not be able to respond to this because she is near due to have a baby. anna marie for the beauty in her fabrics and her lively spirit. 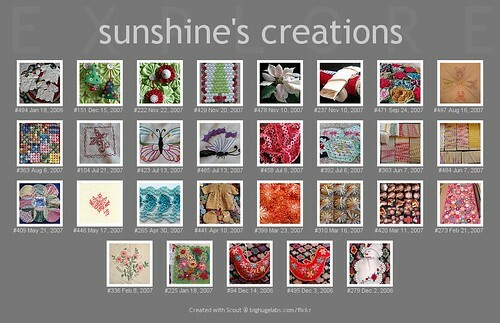 jnny B at allsorts for her vibrant colors on her blog and her tutorials. Maven at Fiborporn for just being kind and helping me find more about oya, and her cool items she makes. Eva at Apple and Eve I love her embroidery and little hedgehogs and bunnies; so sweet, and she produces them so fast. cassi at Bella Dia I love the colors of her blog, the tutorial, and how to's. Great site. eloomination for keeping the weave it alive and having tutorials and patterns for it. mette at Mettetations for all the eye candy yarn and cool projects. Shula at poppalina I just aways feel like she is a kindred spirit in a lot of the things she makes and through a lot of the stuff she has posted about her life. 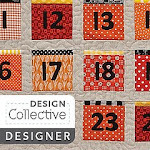 sew mama Sew Always something new and fun happening there; lots of links and tutorials. In the last post all three photos came off of my camera phone. Here are more photos off of my camera phone; these are of my butterfly girl. The top one is one of my favorite butterfly girl photos. 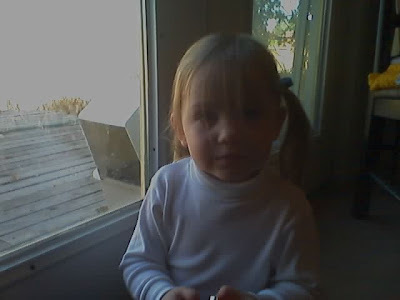 This was taken when she was about two years old; she is now six, so this is an old photo, relatively speaking. I just love it and wanted to make sure it was somewhere other than my camera in case it gets deleted somehow. I hope you like it, too. The second one is what happened when she realized I took her picture. Butterfly girl getting eye exam. I have been really busy since we returned from our trip. 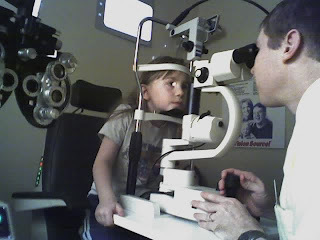 My middle daughter wakes every morning in pain, so she goes to the chiropractor three times a week, and then we found out two daughters need glasses and had to schedule that in on top of piano classes and school and a dear brother-in-law who came home from his mission. Because of this, a sister-in-law and her family came from back East for 4 days of parties to celebrate the mission and all. During which time I got sick. So, if you are wondering why I haven't posted, it is because I am busy busy, but have nothing to show for it other than lots of hugs (which is fine with me; I love hugs) and a stack of washed laundry, as tall as I am, that I just haven't had the time to fold. Photos at left have nothing to do with the above post; just a funny memory I wanted to share. Photo to the left is from September of 2004. Found it in my camera phone. We had spent a day at the beach, and on the way back to our car we saw this. 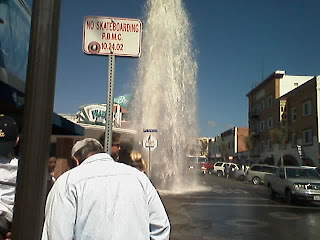 What you are seeing is a classic antique collector's car, convertible mind you, that rolled down a hill at Pismo Beach in California and ended up on top of a fire hydrant. 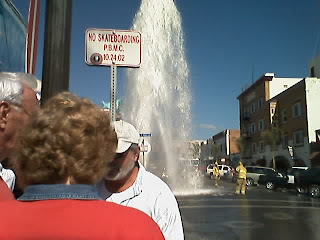 There are firemen trying to stop the geyser in one of the photos. So much for that car; I bet that was a mess to clean out. I would rather have my stack of laundry than that! Oh, no, it's more of those trip photos! Look away, bad movie night...where is the slide projector...just kidding; I hope you like these. The skylines were just amazing at all the ports of call we went to. 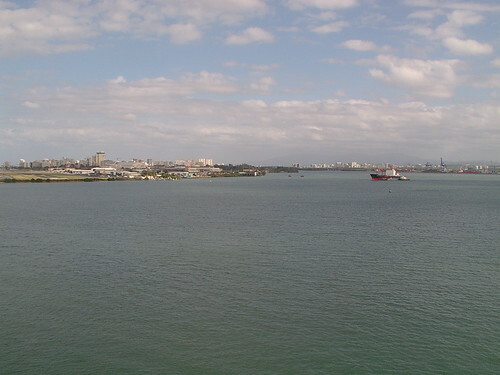 Here is the one coming into the port at Puerto Rico. 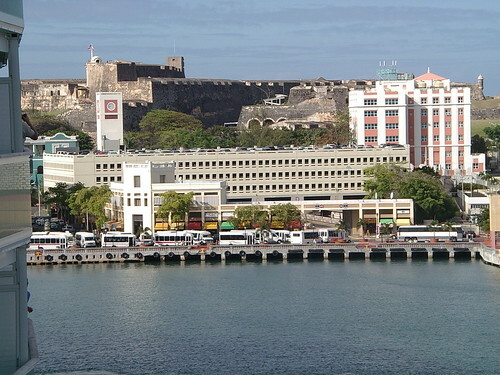 This is from the ship looking over the port to the old Fort in Old San Juan. 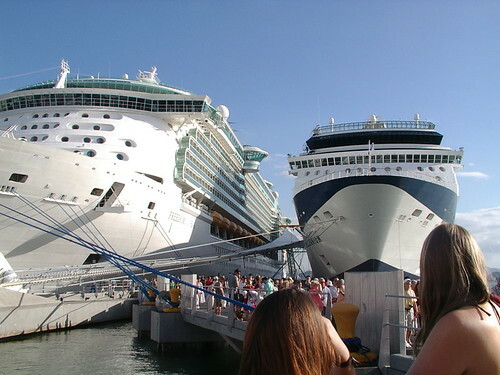 We kept hearing we had the biggest liner on the seas, but until we got off of the ship and looked back at it with another ship next to it, we didn't realize how big it was. All we could say was, "Yep, that is a big ship!" and that sort of sums it up. Ours (meaning the one we got to ride on) is the one on the left. 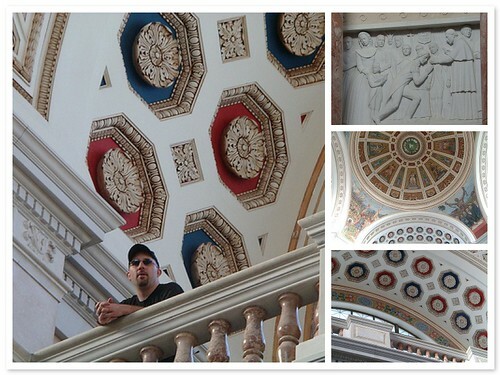 The first place we went was the Capital Building in Old San Juan. This is a very beautiful building with lots of marble from Europe. It looked like it was being renovated when we had our visit there. Even with that, the parts I could see where absolutely stunning to behold. This is the statue that stands facing the capital building; it is St. Christopher (if I remember correctly). He has his finger up in judgment to make sure the work inside is kept in check and that they are doing God's will and not man's. Just so we all know it is his index finger that is pointing not his middle or pointer finger that is pointer, in other words he isn't flipping a bird as it would be called in slang terms in the USA. Interesting to note: if this was in the continental USA instead of one of it commonwealths, it would be torn down -- how sad is that. This would have happened because it is in a public place mixing God and state. Are people crazy? I am glad it is there; I like the sentiment that God is watching over all. 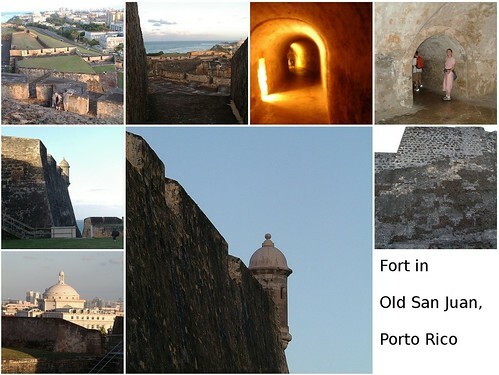 The second place we went to was the Old Fort in Old San Juan. I loved this place; it had such character in the stone work and the sheer scale of things. 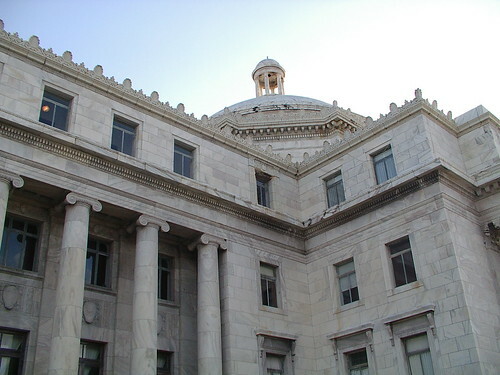 You are able to see just the top of it from old capital building looking towards the old fort. If you look closely at the below photo, it is in the back of the photo on the left hand side. My favorite part of the fort is the in the bottom center picture. I just love the shape of these look-out spots. In the bottom left photo, you can see the capital building from the view of the old fort. 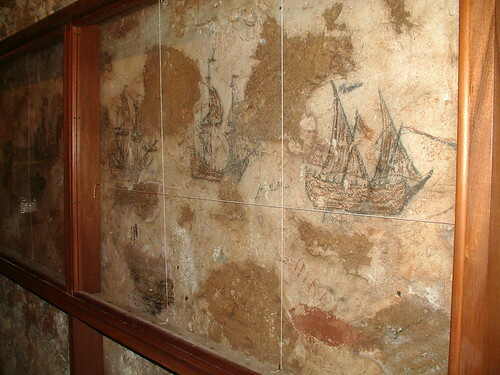 The ships drawn on the wall may be the work of a Spanish caption held here to await execution for mutiny. " Personally, I thought this a funny statement as they may be which, to me, means they don't have a clue how the pictures got there and are just giving you an idea of what may or may not have happened and want it to sound good. I actually liked the pictures before I read the caption. I liked them better without the caption. I think it pulls away from the drawings and degrades them, somehow. Either way, it is a type of graffiti. 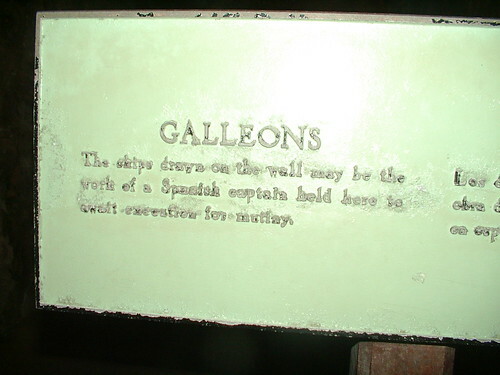 The above cannon balls are on the top of the fort. The interesting part, to me, is that the first row was sunk in cement as if it wasn't enough that they had been welded together, they thought it necessary to bury them in cement. Just how strong to they think the average person is? 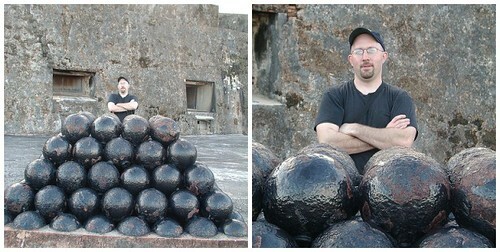 I mean, oh my, there are 188 cannon balls welded together in this stack; the fact that they are hollow still doesn't make them light enough for the stack to be picked up all together and that we must cement it down. I actually thought this was a real neat display; just a little overboard on making it stable and ridged. Actually what is left of some old bricks at the fort in Old San Juan Puerto Rico. I was so impressed with the way they looked that I just had to take a few photos of them. Something about the way nature was tearing them down looked so peaceful and beautiful to me. You can see through some of them where the hole goes all the way through the bricks. After the fort, we went shopping for a little bit and met back at the statue of Christopher Columbus before returning to the ship. 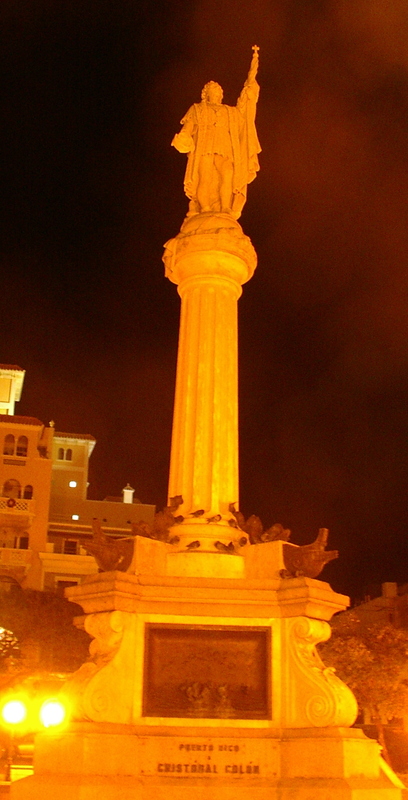 Not sure why this picture came out so bad; it was the best out of three I took of the statue. It was interesting to see how many of the islands have a statue of Columbus. We did not take a picture of each one of them, but this was the neatest one, to me. I posted this doll yesterday, but without it's story. 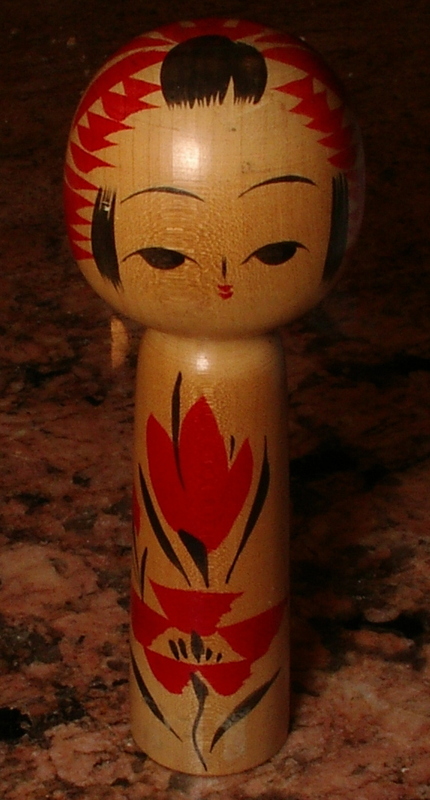 If anyone can tell me more about this Kokeshi doll, I would love that. I found it at a thrift store for 50 cents. 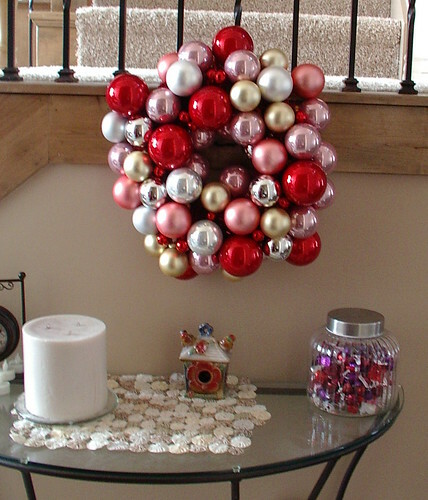 I have seen these on the internet from $30.00 to $130.00. This looks like the lower end price scale to me, of the ones I have found, but I'm not sure. 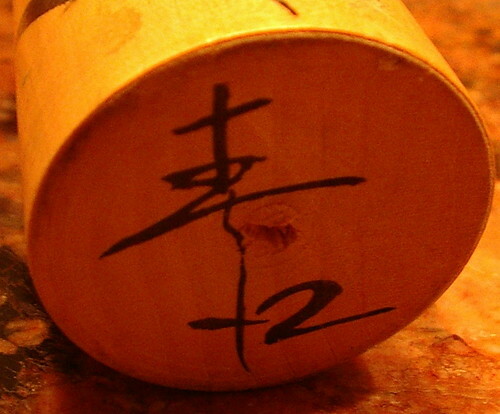 It has a signature on its base; I cannot read it, of course. 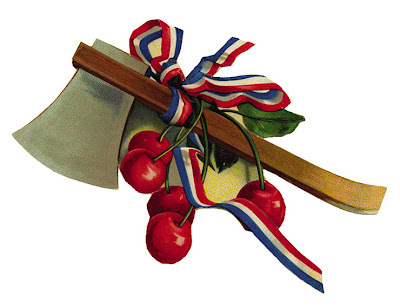 Maybe someone can tell me the name of the artist who made it. I'm wondering if anyone knows how to date this, too. Also, I'm wondering if anyone can tell me if it is a girl or boy figure. I am leaning towards male, but I'm not sure because of what looks to be Kanzashi painted in the hair. I really like this doll; I also like the fact that it doesn't have arms. I'm also wondering what type of flower is represented here. So far, I now know for sure this is a girl, and she is between 30 and 40 years old. She is made from one piece of wood; that was a question I was asked. The name is still a mystery, but I have been told one of the symbols means stone and that that is a common symbol in names, so not much there yet. 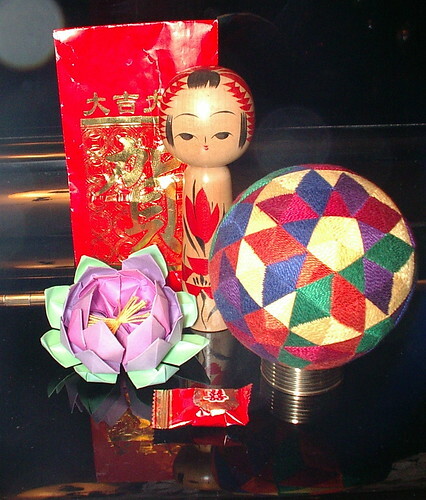 I do know a few of these items are Japanese; I just like them together. OK, so I haven't posted in awhile, for the dozens of emails I received asking if I was OK and if my children are fine. We are all fine and well. 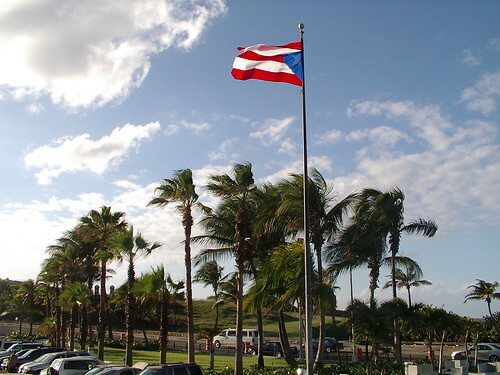 It was a planned absence; my husband and I went on a cruise to the western part of the Caribbean, (Florida, Puerto Rico, St. Thomas, and St Martin, with a layover in Atlanta, both ways). The kids stayed with a very nice aunt of their's on my husband's side. The sad thing about the trip is, I missed two of my daughters' dance recitals at school and an art show by the third. Warning: what fallows is one of those trip photo-sessions. Turn away if you don't want to see this. It is posted mostly for family to see, but have fun looking, even if you are not family. 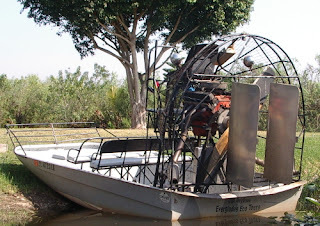 We went on an air boat ride, looked at the alligators and crocs. The one the man is holding to the left I actually held. He is 3 feet long from tip of nose to tip of tail. Too bad the people who took the photo didn't understand how to use our camera and thought they had taken a photo when they hadn't, so no picture of me and my husband holding this guy. But I know I did, and that is all that matters. 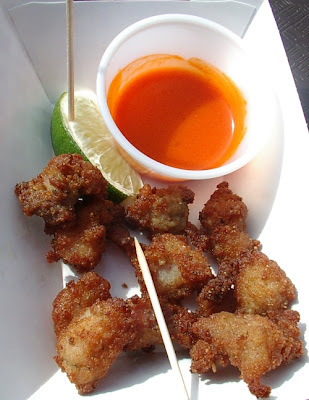 After the boat ride and show we ate some food that the place called alligator nuggets which are supposed to be alligator meat; no bad thought here folks, it isn't that part of the gator. 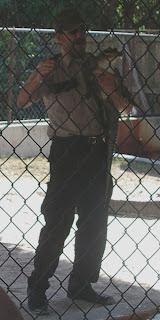 I don't know if it is true that it was 'gator or not, but it tasted good. 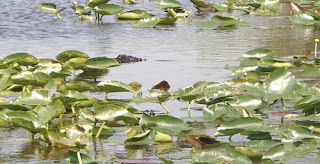 I am not sure if it was a croc or an alligator hiding in the lily pads because I couldn't see the end of its nose to distinguish which it was. If you look closely at the picture, you will see the head starting to submerge. Next set of photos were taken from or on the cruise liner, Freedom of the Seas, leaving Miami and in transit from one place to another. I am not sure anyone can ever look graceful from a below shot while climbing a rock wall. But yes, this is me and my husband. My husband is a real rock climber, mountain biker, snowboarder, ice climber and anything outside that fits in those concepts of outside. So, I would say he did it with much more finess than I did, because the last time I climbed I was 5 months pregnant with my first daughter (who is now 10). The harness didn't feel good cinching up on my pregnant belly, and I haven't climbed since. But I had fun doing this again; I am still a total novice, but I have to admit rock walls are much easier than the real thing, at least the ones I have been on. 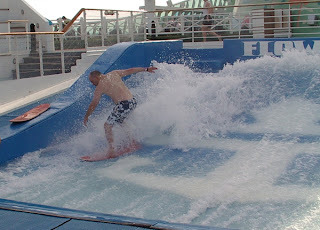 My husband also went on the flow rider a way to sort of surf on the ship. 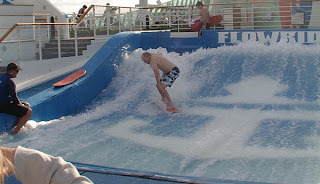 My husband's statement about the flow rider was that "it is very efficient at stripping the clothes from your body". I never saw him with out his trunks while on this but there was a few times he didn't leave the ruff water very quickly. He really did pretty good for his first time on this type of thing. But that is no surprise to me as he skateboards and snowboards differnt beasts but a little bit similar in concept I think. 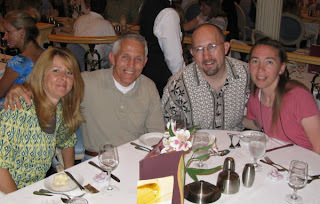 Having never been on a cruise liner I was amazed at the scale of things they can place inside and on a ship. 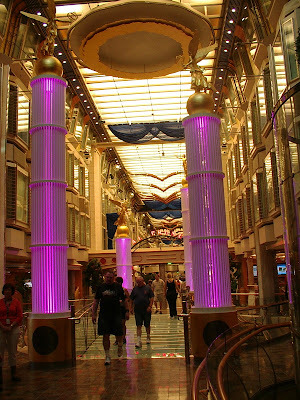 Seriously look at this inside of a ship it looks just like the inside of a really tall mall. 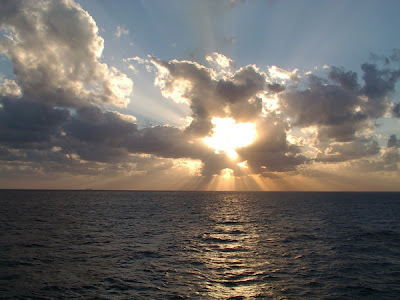 But then nothing matches the grandeur of the things outside the ship that you can see. I feel like a little kid here as it is amazing to look at the horizon and not see mountains. I have always been able to see mountains from my home even growing up in California they were just 30 minuets away now I live on the side of a mountain. There isn't even land in some of these pictures let alone mountains. 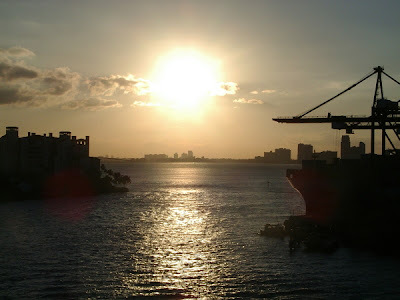 It was fun to take pictures of Miami as we left port as well the silhouettes from the sun going down was amazing to me. Those of you that read my blog often know I am just in love with sunsets and sunrises, I have seen some of the most gorgeous of these in my life in the last few weeks my photos just never did them justice. I am sure you are sick of my trip for now I will post more later got to get the kids up for school.